Like animal paintings, seascape paintings have a peculiarly important place in the British heart. 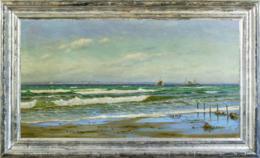 Seascapes or marine paintings are one of the oldest strands of art: at least, if pictures of lone boats are included. Neolithic pictographs of boats engraved on rocks have been found all over the world, including Egypt, where images of boats driven by oars or by sails (c. 4500-3100 BC) have been discovered. For much of history, boats and ships have been the only long-distance means of transport not powered by animals, and thus a metaphor for man’s innate adventurousness, his ability to trade, and the power wielded by a sea-going country. For the ancient Greeks, the story of Odysseus represented all these aspects (the abduction of Helen by the Trojan Paris and the subsequent conflict between Greece and Troy are thought to mask a trade war), and is frequently depicted in vase paintings and mosaics. The name vase of the Siren Painter in the British Museum shows Odysseus lashed to the mast on an Attic red figure stamnos of c.500-480 BC, to escape the song of the Sirens; his ship is a sophisticated vessel of war, with rigged sail, battering ram and oars manned through ports. The Roman floor mosaics of c. 300 AD from Lod, Israel (Metropolitan Museum, NY), show, as well as naturalistic images of exotic animals, a marine scene: a merchant ship amongst recognizable edible and predatory fish. Here, the creatures of the earth are described through an everyday seascape, rather than through myth and metaphor: wealth depicted through realism. During the Middle Ages in Europe, representations of ships and the sea become isolated and stylized – certainly in comparison with these Roman mosaics – but during the early Renaissance marine scenes are increasingly common, often as a background detail. One of Jean Fouquet’s illuminations for the Grandes chroniques de France (a record of French history, from the 13th to 15th centuries) shows an early coastal scene, c.1455-60, in which Queen Isabelle of France disembarks from a rowing boat onto a shingle beach, as a fleet of ships with multiple masts and rigging bobs on a choppy blue sea behind her. By the 17th century, seascape paintings were subjects in themselves, and the province particularly of Northern artists. The Netherlands were small compared with other European nations, aiming for power beyond their size by focusing on their sea-borne capabilities in trade, colonization and war. The Golden Age of Dutch art is one of sophisticated and dramatic marine paintings, in which careful study of the sea and the weather produces highly naturalistic renderings of storms, sunsets and calms; these might then be marshalled as symbolic glosses on the painted subjects. Jan van der Cappelle is one of the foremost of these marine artists, although he concentrates on tranquil seas beneath vast cloudy skies, in which the transfiguring power of light is a major theme. Willem van de Velde was on the contrary an official war artist to the Dutch navy, and later on was employed by Charles II of England. His seascape paintings are thus mainly battle scenes, which he could depict accurately because (like a modern war artist) he had himself transported around the actual location of the battle. The Van de Veldes introduced the art of seascape painting in the Dutch style to Britain, where it became established during the 18th century: artists such as Samuel Scott, Peter Monamy and Charles Brooking naturalized it with bravura works celebrating (as well as naval battles) the port of London, English shipping and impressive observational depictions of sky and sea under all variations of local climate and time of day. This range was further increased by the work of William Hodges, who travelled with Captain Cook on his second expedition. A Romantic tendency in Brooking’s art found its apotheosis in the seascape paintings of Turner, whose range extended from marine storms in Van de Velde’s style, through dramatically allegorical pieces such as his Battle of Trafalgar (1822-24, National Maritime Museum), to The Fighting Teméraire, which heroizes a ship from that battle, setting it against a contemporary coal-powered tug. 19th century Scandinavian artists extended the northern range of the genre, painting seascapes which celebrate vast northern skies and empty ocean as well as ports and shipping; groups such as the British St Ives school of the 20th century tended to prefer coastal and beach scenes. The two World Wars produced artists who focused on mariners and naval officers, whilst the wider 20th century has seen every variation on marine painting, from photographic realism, surrealism and expressionism to near-abstraction. One beautifully calligraphic example of this variety is Lyonel Feininger’s ability to conjure the rhythmic and musical qualities of a seascape in pen and watercolour.